Ekuthuleni Lodge provides guests with malaria free Limpopo safari accommodation. 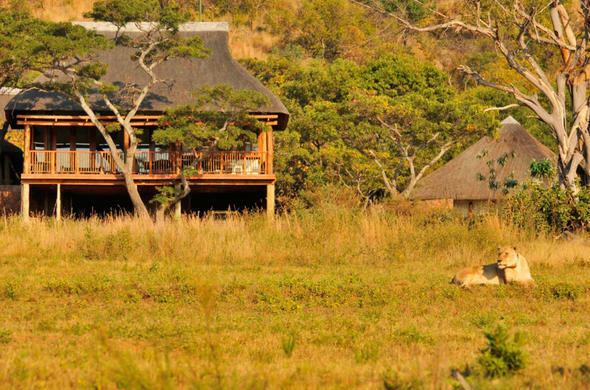 Ekuthuleni Lodge, meaning place of peace, is located in the Welgevonden Private Game Reserve. This Limpopo safari lodge is one of the largest privately owned game reserves in South Africa, spreading over 40 000 hectares of African bush. Birding enthusiasts will be delighted with the large amount of bird species that have been recorded so far. Situated in a malaria-free area of South Africa, Ekuthuleni Lodge offers guests comfortable South African safari accommodation in a breathtaking environment. Guests on their African safari holiday can choose from an exclusive total of 5 elegant chalets. Originally farm land, major game species have been reintroduced with remarkable success. During this South African safari vacation, guests can possiblyspot the Big Five (Lion, Leopard, Elephant, Buffalo and Rhino) on their game drives, as well as several other species, such as Bush Pig, Aardvark, Giraffe, Warthog and Pangolin.